A couple of miles to the north of the more famous Hales sits the church of St Gregory, Heckingham. The two are always spoken of together, and not just because they were once a joint parish (both are now redundant). 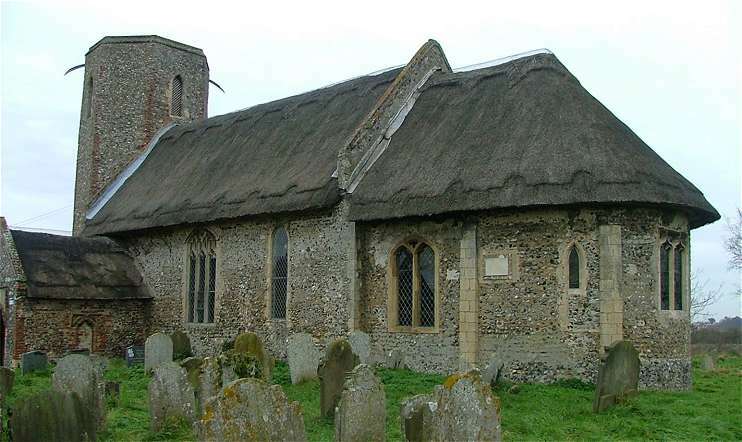 They are probably the two best examples of small, rural Norman churches in all East Anglia. The south doorway here is so similar to the north doorway at Hales that they must have been made by the same person. I know this is a sweeping statement (I got it from Pevsner) but as the design is not as elaborate as, for example, Wroxham, I do not think one was copied from the other because of beauty or perfection. Hales, justifiably, is more famous than Heckingham because it is so untouched, so perfectly Norman still. Also, it has wall paintings of great interest, which Heckingham doesn't. But if I may be allowed to go against the grain, I think that Heckingham church is more atmospheric, despite, or indeed perhaps because of, its going over in the late medieval period and again in the late 19th century. Also, there is inside still an air of the 17th century life of the place. Its setting is superb, silent and lonely along narrow lanes, on an overgrown mound. 18th and 19th century headstones wash higgeldy-piggeldy around it, and beyond there is only the old Rectory for company. I like it a lot. Externally, the tower was extended in the late medieval period - probably replaced to allow a more ambitious bell arrangement. The fine late Perpendicular windows were installed, and most intriguing of all the porch. Look at it - it is clearly early/mid 16th century. There is a niche that has been filled in, but the tablet above the entrance has shields that are probably secular. One imagines some long-suffering sexton in the turbulent 1550s trying to second-guess the religious enthusiasms of the reigning monarch. Inside, the chancel arch is unfortunate, the chancel itself middle-brow late Victorian, but the east window Annunciation, of 1910, is rather good. I wonder who the artist was. The Crowe family left some dramatic ledger stones in the 17th century; the fierce puritanism of the earliest giving way to a sentimentalism in the later ones. You can see them, and their inscriptions, below. A small brass inscription in the nave asks us to pray for someone's soul. They died in 1407, but I cannot for the life of me make out the name. Angeltis? Again, see below. The font is Norman, but an engraving of the 18th century shows a more modern font - probably the Victorians wanted to make the interior more Norman than it was already, and found this one somewhere else. But they are not to be blamed for the north aisle - as Victorian as it appears, it is wholly the work of the medieval period. Perhaps the low budget makes it seem so rustic.